You can save a human life without even knowing first aid. 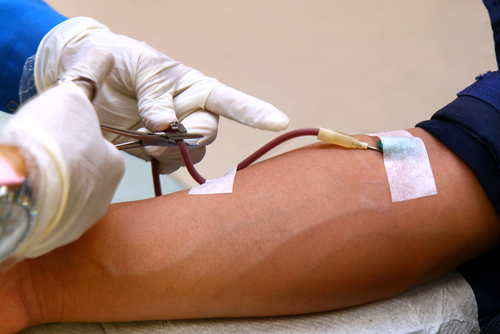 It will only cost you 450 mililitres of your blood and about 45 minutes of your time. The Department of Transfusion and Tissue Medicine of the Brno University Hospital has started collecting blood from foreign donors in June. “We welcome English-speaking foreigners of all blood types,” confirmed Hana Lejdarová, MD. To become a donor, you need to meet a few requirements. It is necessary to be between 18 and 65 years old, to weigh more than 50 kilos and to not suffer from any disease. Also make sure you haven’t taken antibiotics in the last two weeks, had no tick bite during the last month, and no tattoo or piercing done in the last six months. If you have travelled out of Europe, your donation needs to be postponed for six months due to an increased risk of malaria, infectious hepatitis, or other blood-borne diseases. Also anyone who lived in France or the United Kingdom from 1980 to 1996 for more than half a year mustn’t donate blood because of the risk of the BSE. What else do you need to donate blood? A valid ID (passport) and Czech health insurance. Please refrain from eating fatty foods or drinking alcohol for twelve hours and smoking for three hours before the blood collection. The donation itself only takes about 5 minutes but you will spend about 45 minutes at the Department of Transfusion. First you fill in a blood donor questionnaire, then they take a sample of your blood to check if you meet their requirements. If so, they collect your blood and then you rest for a while and get a snack. On the day you donate blood, you should not plan anything strenuous. The Czech law even guarantees you a day off of work, but if you work in an office you should be fine. Just take it easy and feel good about yourself! Men can donate blood every 3 months, women every 4 months. Seemingly, the festive classic It’s A Wonderful Life couldn’t be more different to action masterpiece Die Hard. There are some interesting similarities, though. Come see both movies at The Immigrant (Veveří 57) on Sunday, December 20 at 7 pm!